Fall Lawn Care Tips to Keep You Well-Seasoned - Executive Landscaping, Inc.
Fall is more Important than you Think! When you’ve got a lawn, especially in Florida, it can seem like an uphill battle to keep things looking good through the scorching heat of summer. Not to mention how oh-so-fun it is to have to go out in torturous temps and sweat to death while you try your best to get your yard in shape. You mow, you water, you curse – and then repeat it all again, week after week. And it can be easy to think you can rest on your laurels and let it all take care of itself once fall rolls around and the growing and mowing season is coming to an end. Not so fast. Before you drain your mower and toss aside your garden gloves, you’ll need to do a few things to get your lawn ready for fall, as autumn is actually a critical period in fortifying your grass for winter and ensuring it will spring back into life when spring goes into bloom. Pay attention to the weather. It is easier to add water than to take it away. Keep on mowing. And watering. But be weather aware. You do not want to over water! Aeration should get high priority on the list, as well. Aerating allows the grass to breathe, absorb more water, and more have more ready access to the nutrients that will come from the fertilizers that you’ll be applying this season. Aerating basically punches holes into the soil and extracts nice little plugs of dirt, kind of like giving your yard pores. 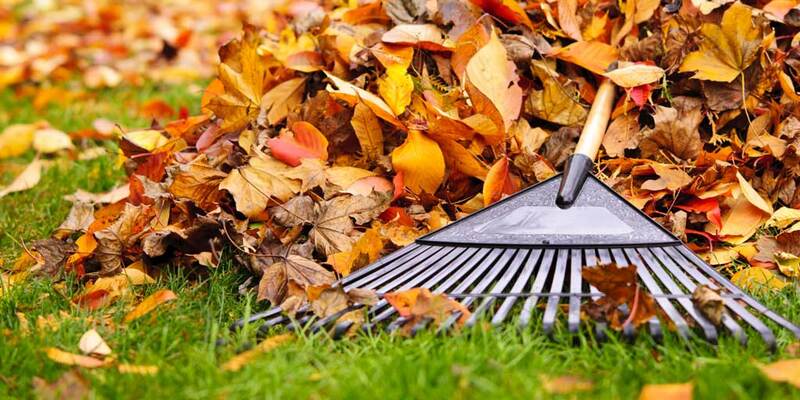 Rake leaves, because an accumulation of leaves will essentially turn into a barrier between your grass and any sunlight and oxygen it would otherwise get. Thick mats of un-raked leaves also put turf at risk for breeding fungal diseases. In the fall, you want to back off on nitrogen because you do not want to push growth. You do, however, want to encourage roots so they sustain through the winter and are ready for spring growth. Leaves may go dormant, but grass roots are still growing steady and staying hungry. Applying the proper fertilizer in mid-to-late fall will give your turf a better shot at being healthy in spring. Get wicked on the weeds, as well. Fall is a great time to get more aggressive with weeds using herbicides. Grass is dormant in the fall and winter, and you will be better able to go after weeds without impacting the grass. Weeds are all about getting their roots fat and happy before they go into dormancy, so any herbicides you apply will be a welcome part of their fall feasting. Feed them now, and they’ll die off before spring. Most weed killers are best-applied in early-to-mid fall, but read the label of your chosen product to make sure. Show your grass some seasonal love! Give the team of lawn care experts at Executive Landscaping, Inc., a call today to find out more about how we can help guide you through fall!